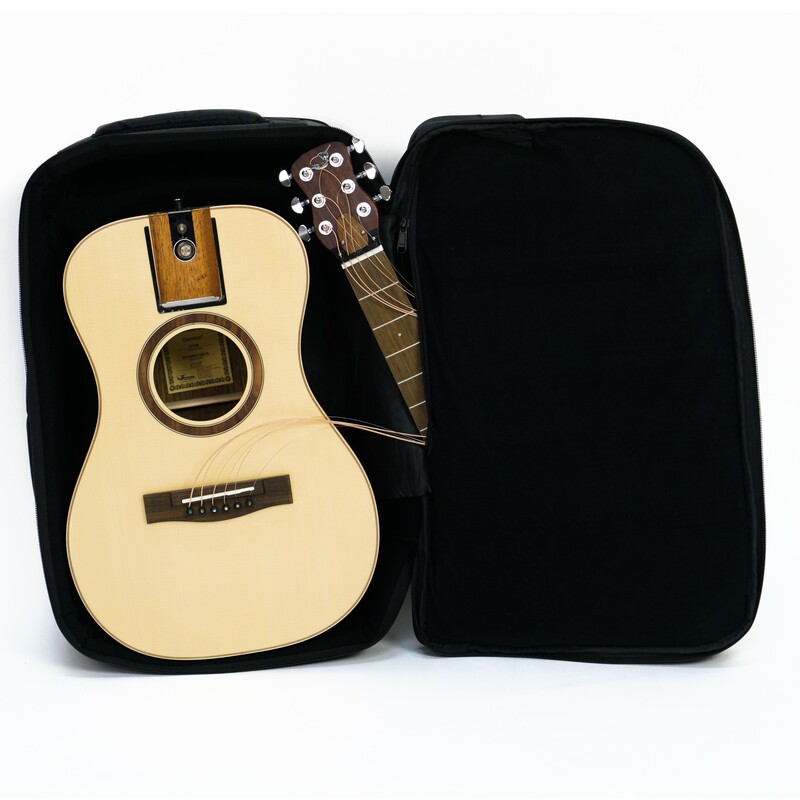 Journey OF-420 Travel Guitar Review – Detachable guitar NECK! 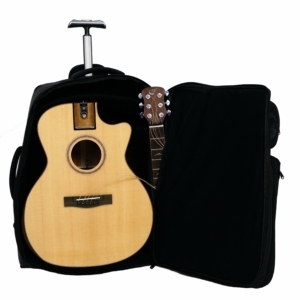 If you are tired of worrying about your full size guitar when traveling, this is a must have. I’ve always checked my guitar when traveling, but have never been comfortable doing so. This guitar is about the size of a 3/4 guitar. If you have played a travel guitar, you understand the dilemma. No travel guitar is as satisfying as a full size guitar. 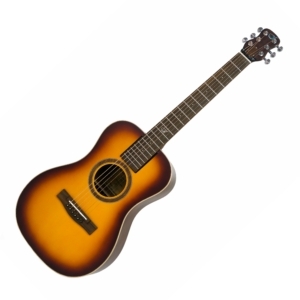 This guitar has a nice tone, but when paired with a ToneWood amp, it deliveres a full size guitar result. 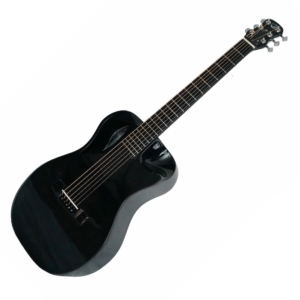 Amazon also sells the carbon fiber model of this guitar. 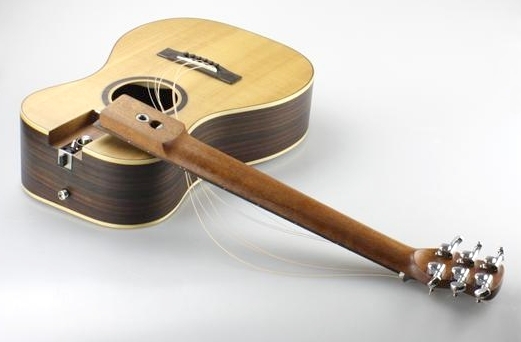 If you want an indestructible guitar, buy that model. It is about twice the price, so I bought this one. To see how this guitar sounds with a ToneWood amp, search “Journey OF660 with ToneWood amp” on YouTube. I love love love this guitar. 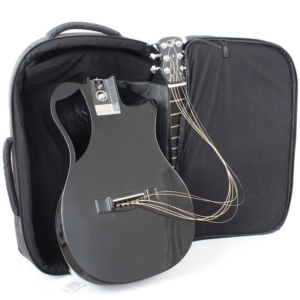 This is an excellent travel guitar. 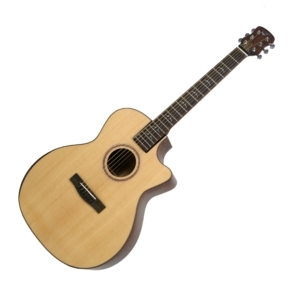 Good sound and fine playability and feel. 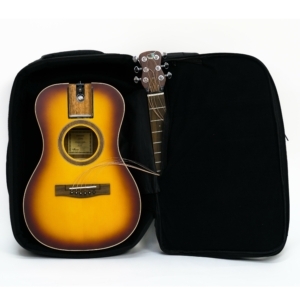 The case provides much space for additional music or travel accessories. 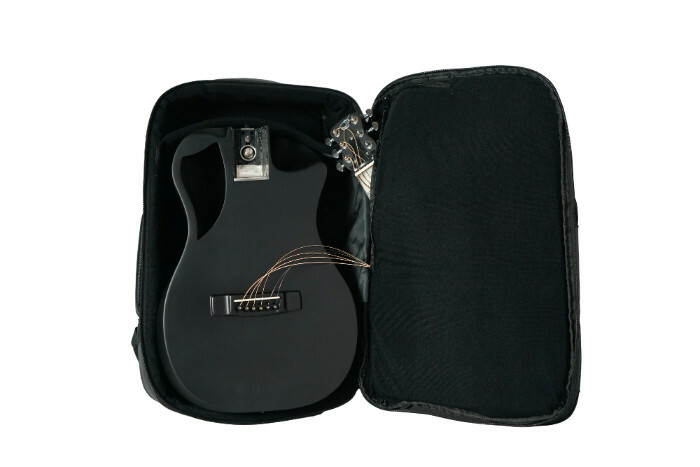 I bought one of these (actually, the OF420B burst model) at a LGS before they became available at Sweetwater for a trip I had upcoming and have been consistently impressed by the playability, ringing sustain and tone I am able to coax from the little beast. In fact, I have stopped storing it in its case and it’s sitting out on a stand in the living room these days. I bought it because on a recent interntional trip, my Emerald X7 had to be gate-checked several times, and I wasn’t really comfortable with that, even though it’s carbon fiber and should be OK. I would have liked one of the CF Journeys, but that wasn’t available when I needed it, so I got the 420, and have not regretted it. It required a bit of a setup when I first got it (a half-turn on the truss rod) and has settled in quite nicely. As I indicated above, the tone is surprising for what is essentially a parlor or 0-sized instrument, and it really fits in the overhead – even on one of those miserable, little Candadair regional jets! 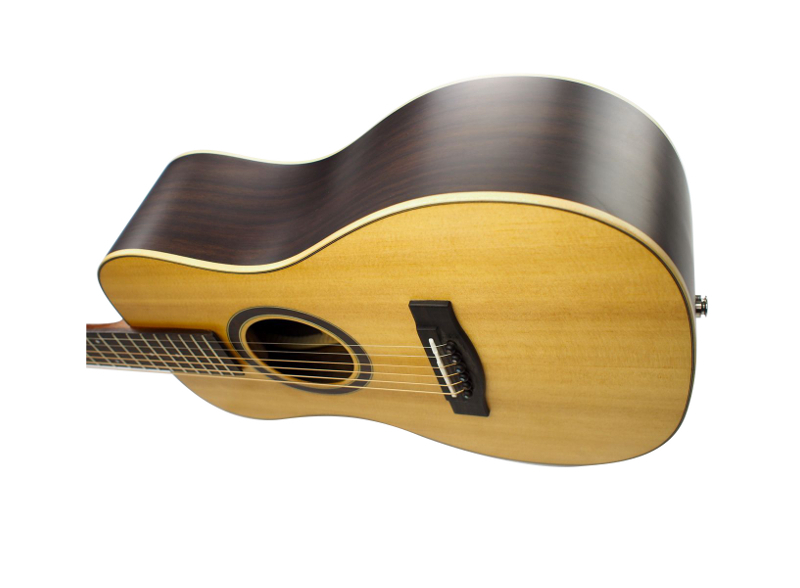 The guitar itself is beautifully built with solid Sitka Spruce top and rosewood back and sides, Bone nut and saddle, built in passive pickup, Grover mini tuners, mahogany neck that comes off… Yeah you heard it right. If you don’t believe me now would be time to check out the video I made with the guitar (at the top of this post). You also hear the sound quality of the instrument. So yeah, it comes apart, fits in a nice backpack, but how does it play? After attaching the neck few times I’d like to point out one thing. Once you have secured the neck, firmly press the neck towards the body and give the locking mechanism one more twist. This will secure the neck tightly, and once this is done the guitar stays in tune very nicely and the intonation is spot on…. 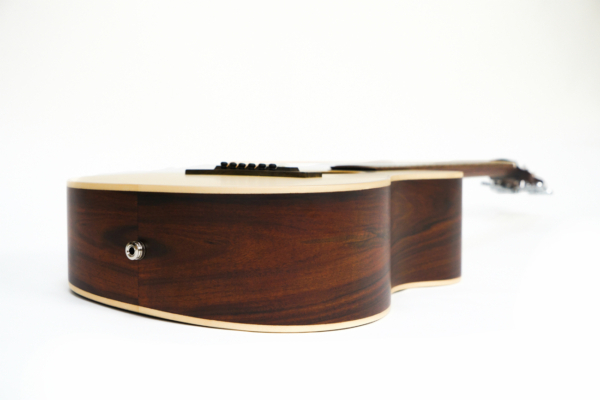 The second guitar I reviewed, the Sitka Sapele OF410, is a solid-top sitka spruce with layered sapele back and sides. Unlike the carbon fiber model, the Sitka Sapele had a traditional sound hole and no cutaway. 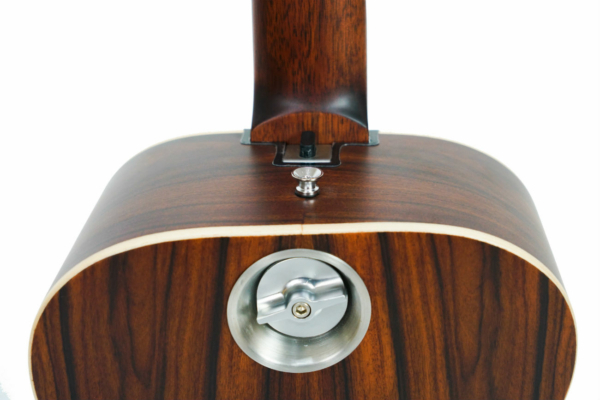 Both guitars feature a wedge design which means it has a wide base that tapers toward the top. According to Journey Instruments, this feature helps increase guitar volume…I’ve never manufactured a guitar before, so I can only imagine how difficult it must be to engineer a guitar that can collapse into two pieces for storage. 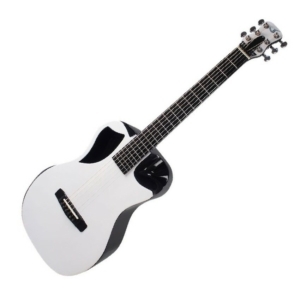 The most popular collapsible guitar I know of is hinged so that the neck and the body are always connected, even if it folded down… For those who need a guitar that travels well but still sounds like a full-sized guitar, I highly recommend you give the Overhead a look. 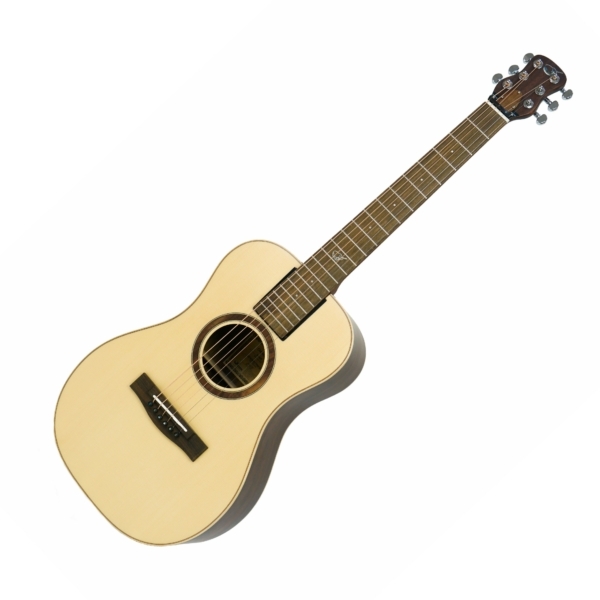 It’s not a beginner guitar and it is a bit of an investment, but if it fits what you need it will be worth every penny. The Journey OF410 will fit nicely in your quiver. This guitar’s function is to accompany a traveler. Bring it along on a business trip and busk at night! 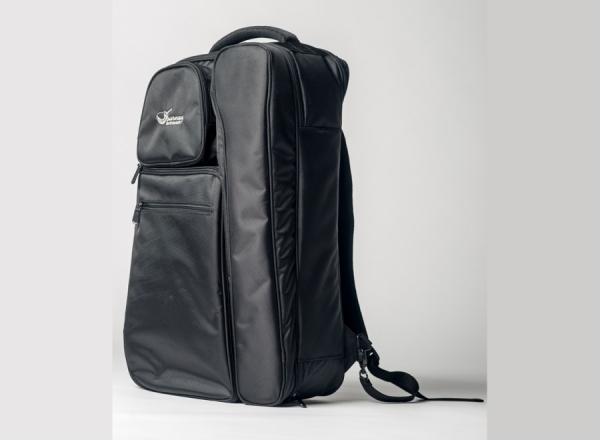 The neck is attached by pivot point and a very robust mechanical faster that packs away into a standard size carry-on bag. Reassembly is very simple, but of course you’ve got to tune it afterwards. The guitar held it’s tune pretty well with normal fall humidity conditions. 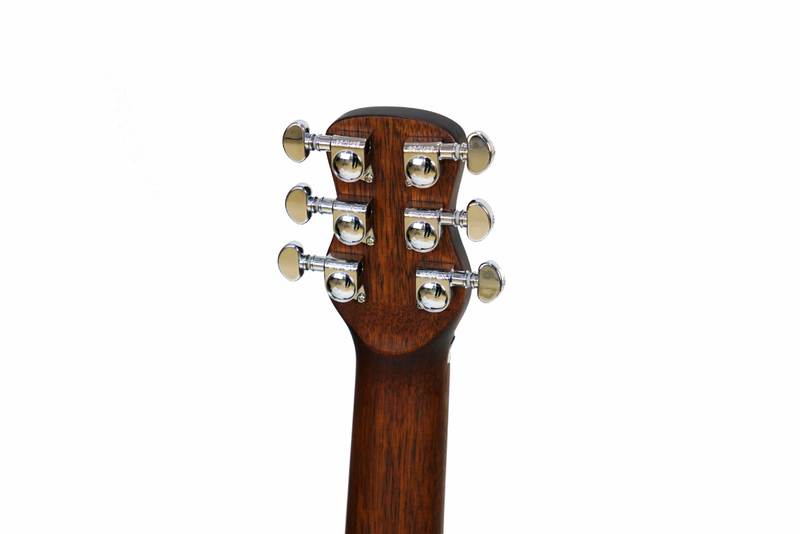 The headstock is small, but the neck is full length, or close enough to not feel claustrophobic. 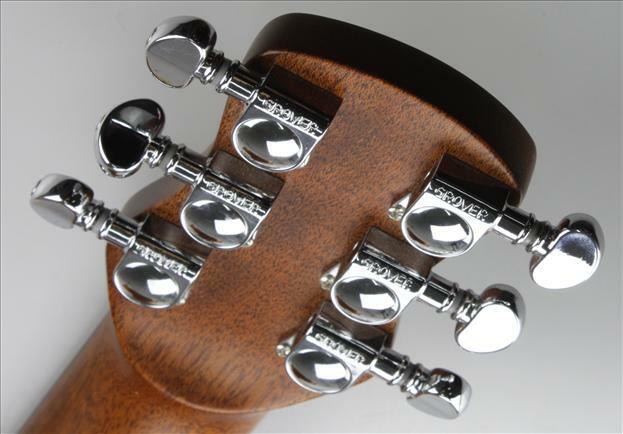 It plays in tune all the way up the neck and the octave is right on. Overall construction on this instrument is precise. 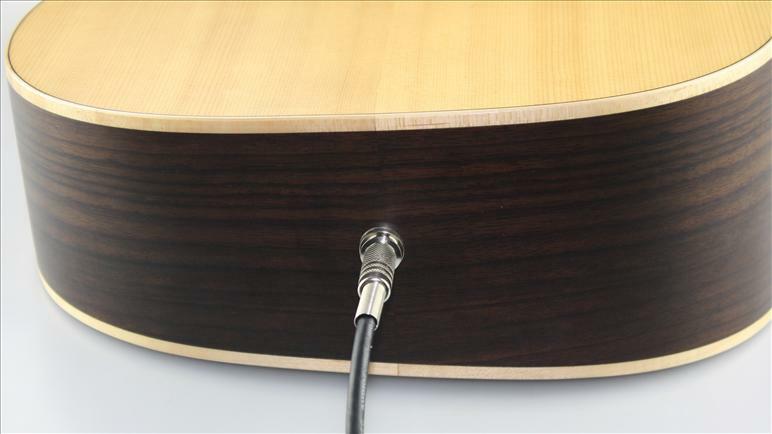 The body of the guitar is thinner at the top if you’re right handed. Journey has really thought out how to get the biggest sound out of a limited volume for travel purposes. 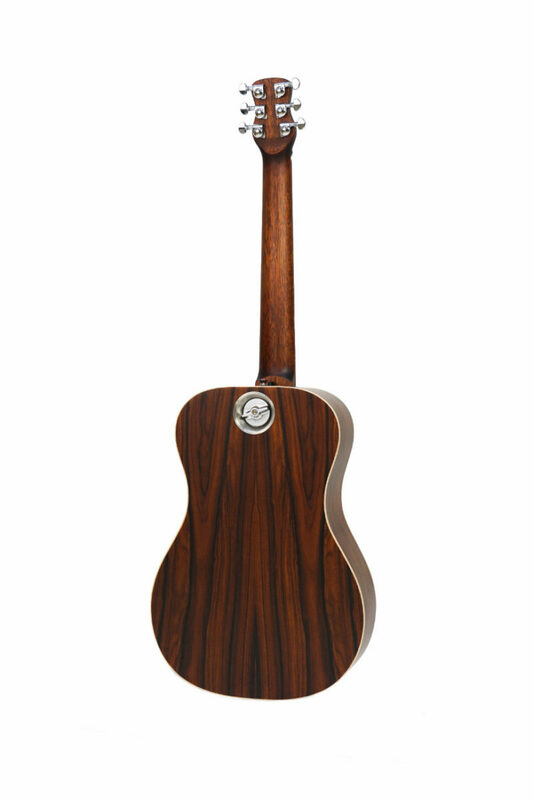 The FF412C FirstClass Overhead is a collapsible full-sized Grand Auditorium guitar that features a solid sitka top with solid African mahogany back. It collapses to carry-on roller case that’s 22*16*9.5 inches, and assembles in 20 seconds with our patented detachable neck system that’s guaranteed for life. A full 25.5 inch scale, a versatile 1 3/4 nut width, best-in-class components, and a Manzer wedge ergonomic design give this collapsible GA amazing playability, and astounding bass and volume! 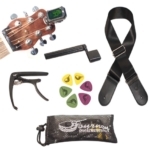 Comes with our proprietary passive tri-piezo pickup system. 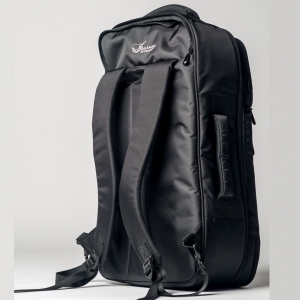 The OF420B Overhead features a solid sitka burst top with layerd pau ferro sides/back and collapses to carry-on size of 22*14*9 inches! It assembles in 20 seconds with our patented detachable neck system that’s guaranteed for life. A full 24.5 inch scale, a versatile 1 3/4 nut width , best-in-class components, and a wedged ergonomic design make this the most enjoyable guitar you’ll ever play! Tri-piezo pickup and a full-featured TSA compliant carry-on backpack included.